President Obama Labor Day sign paid sick leave executive order. 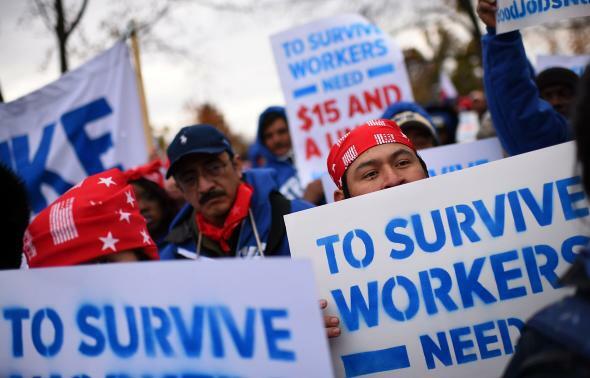 Striking government contract workers protest on the east lawn of the U.S. Capitol November 13, 2014 in Washington, DC. President Obama will mark Labor Day in Boston by signing an executive order requiring federal contractors to offer what amounts to a week of paid sick leave each year for employees. Contract employees doing work for the federal government are currently not entitled to being sick on the job and are part of the 44 million private sector workers—or about 40 percent of the private sector workforce—the White House says does not have paid sick leave. The new standards come as part of an ongoing overhaul of workplace standards imposed by the Obama administration. “Under the executive order, employees working on federal contracts gain the right to a minimum of one hour of paid leave for every 30 hours they work,” the Associated Press explains. “Stretched out over 12 months, that’s up to seven days per year.” The new standards will go into effect on federal contracts after Obama’s presidency, starting in 2017 following a public comment period on the order. Critics of the order, on the Hill and elsewhere, say the White House has not said where the money will come from to pay for additional labor costs. “We believe the cost of implementing this rule is offset by the efficiencies that come with reduced attrition, increased loyalty, all of those things that have been documented in a number of studies of state laws that have been enacted,” Labor Secretary Thomas Perez said.